The National Chairman of the Peoples Democraic Patrty, PDP, Uche Secondus, has warned the federal government against sending military for former Benue State Governor, George Akume, to rig election. He warned against the planned deployment of military personnel to help Senator Akume to manipulate elections in favour of the APC in the state. 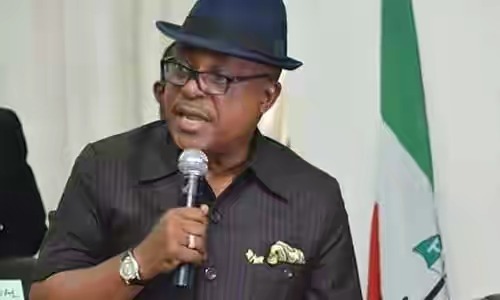 Secondus gave this warning in Makurdi on Friday during the PDP presidential campaign rally in the state. The PDP leader also slammed Governor of Kaduna State, Mallam Nasir El-Rufai for his reckless statement threatening foreign observers that they will return to their country in body bags, saying he should be sanctioned and taken to international court for threat to peace and democracy. Benue State Governor Dr Sam Ortom told his people that unlike the APC candidate President Muhammadu Buhari, the PDP flag bearer will respect the rule of law and will attend to the disturbing issue of unemployment in the state and the country.